The Tattoo Community Project Pack! Looking for a fun and unusual gift for that art fan in your life? We have a ton of great stuff at the Hyperspace Studios online store including high quality art prints of all price ranges, shirts and other cool wearable items, books and DVDs. Today we are featuring the Tattoo Community Project Pack, which includes several fun books and documentaries featuring a great variety of art from a range of different artists. 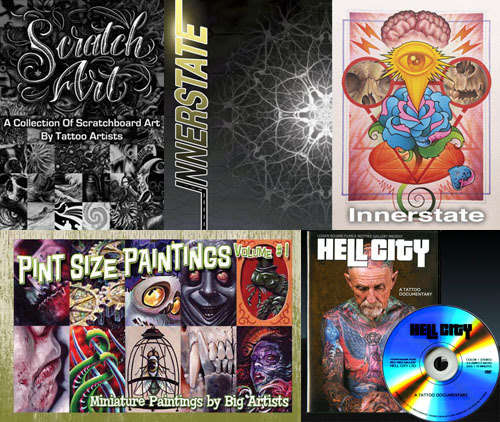 This includes the Pint Sized Paintings, Scratch Art and Innerstate books, plus the Innerstate and Hell City documentaries, all for the special price of $85. Come check out what else we have at the Hyperspace Studios online store! Guaranteed US Christmas shipping on all orders received by December 16, 2018.